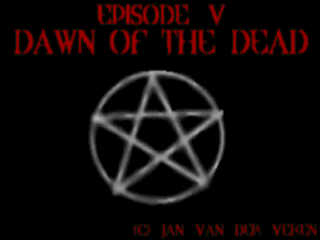 Dawn of the Dead isn't really a duplicate of the E1 theme. 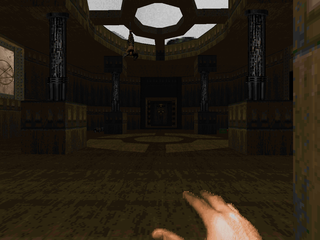 The first five maps (including E1M9) are certainly in a techbase theme, but there are enough bizarre trappings to suggest something more along the lines of Doom's E2. Furthermore, the latter three maps have a distinctly different feel, tending more toward castle-like compounds. 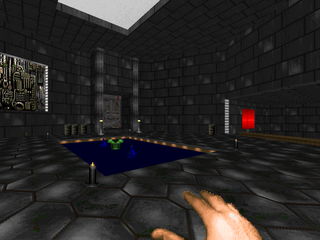 It's also a fair bit harder than E1, using Doom's normal bestiary quite extensively and intelligently, with an emphasis on barons, at least in UV. The difficulty's pretty easy to start out with but toward the end, at least on pistol start, you'll suffer from a restricted armory as well as some devious traps, including plenty of instances where Veken tries to trap you in with some bloodthirsty toughs. This WAD looks great. There's plenty of fantastic detailing and lighting. Especially the lighting. None of the maps fall flat in my opinion. E1M8 is a bit of a letdown compared to everything that came before, but I think it does a pretty good job of replacing "Phobos Anomaly". Really, Veken's nailed down his own particular "classic" style, which I prefer to simply aping the old standards. Dawn of the Dead is well worth a play. I'd recommend it to any fan of the original Doom looking for something tougher (at least, tougher than the default three episodes). To round things out, there's an original title screen as well as some new music, some of which I recognize. There's also a little DeHackEd patch to change level names. I just wish Veken had finished his project. So it goes. Fun little opener with mostly E1M1 fodder. Nice opening starting the player off with some imps to chase him into the base. 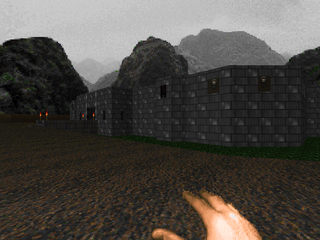 Other cool moments include a vanishing walkway (a Doom staple) and a blur sphere shrouded in darkness. Also like the secret, set up quite nicely by the enviro suit in the corner. The cherry red cacodemon box kind of suggests an E2 flavor, but it's a nice hook. 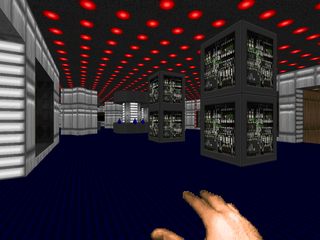 Another way cool techbase level, but this one has some more memorable moments / architecture. 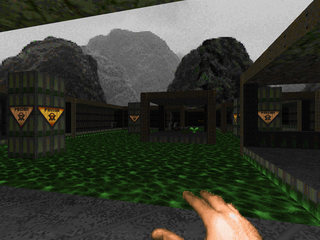 There's a nukage pool with some deep water effects, very nice, with a good Ultimate Doom ambush immediately following. Also enjoy the little E1M7 homage, though this map is much less confusing. I feel I should also call attention to a very long, very cool secret trek through the base's sewers, awarding explorers with a soul sphere that thoughtfully puts the player in a position to return to the main walkway. A little more pressure than the previous map, but that's almost entirely due to the increased monster count. Veken shakes things out with a much larger techbase with some nasty surprises. Among its architectural features include plenty of outdoor playing area as well as a landing pad, though in a fairly impractical location. Good touch with the lights in the tunnels gradually activating as you move forward. I also dig the red door elevators. As for the encounter stuff, Veken ups the ante by introducing barons in several locations. Granted, secret searchers should have a rocket launcher, and one of the fights IS a secret, complete with BFG. There's a particular ambush in the eastern wing that caught me off-guard. Finally, the secret exit comes as a bit of a surprise, locking you out from investigating the rest of the map. Still, very fun, and the author is slowly easing into tougher fights. Things heat up in this punchy map, a predominantly light brown techbase. It's a bit tricky as a pistol start and I seemed to always catch a devastating shotgun hit from the snipers by the opening stairwell. There's a definite lack of health for most of the map that contributes to the desperate atmosphere. Also a few cage traps that introduce you to some friendly barons to keep you feeling nervous. Veken also lets some lesser monsters into the atrium which will hunt you down. I liked the open-air section that dominates the map's northern section as well as the steel cathedral to the northeast. Excellent extensive sewer-ish map. There's a lot of nukage and the layout isn't quite as convoluted as, say, E1M3. Of particular note are a number of unofficial secrets, some of which lead into the outdoor area. There's an awful lot to explore and do here. The northern segment has some of the cooler architecture. There's a room with three pillars and metal struts I particularly enjoyed as well as the red key room and its second encounter, complete with an inverted cherry-red cross. I also enjoy the central sewer section, surprisingly. Veken's use of the red overhead lights rescue the nukage they hover over from blandness. This is a placeholder, which Veken never filled out, a fact surprisingly glazed over in the more in-depth reviews I've read (but mentioned in the Doomworld's Top 10 list). Just an exit chamber, strongly resembling the one from E1M4. Breaking free of the E1 style to produce a castle-style level in dark grey granite. 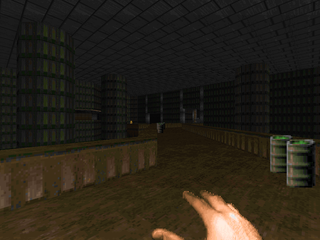 Ammo's a little tight at the beginning, and the trend more or less follows through most of the map, but there are plenty of enemies to rip and tear (plus there's a fairly obvious plasma rifle secret available at the beginning, a fact worth mentioning because every opportunity to grab more ammo is trapped, introducing lost souls into the map). I like the fortress layout; you gradually explore the outer walls as you acquire keys while the basilica has an excellent yard fight followed by a warp ambush that encourages a little infighting. 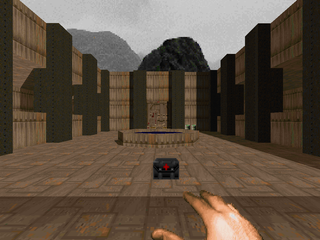 Another definite highlight is the Quake slipgate-style secret found in the northern end of the castle. Very fun! I went into this brown castle-style level aware of the potential ammo shortage only to end up with a boatload of ammo when all was said and done. Granted, I did a fair amount of punching, but I think the perceived lack of munitions is exaggerated. What I really wanted more of was health. The level reminds me of something Anderson might have done, with its emphasis on brown, metal columns, and great criss-cross lighting. Especially love the skylight right after the opening room. Difficulty is a bit harder, with a tense opening where you're better off running past a lot of opposition. Then there are a number of nasty traps, places where enemies teleport behind you or into cramped quarters, with extensive use of barons. 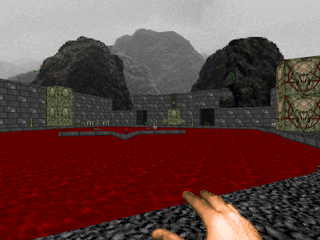 The highlight of the map, of course, is the Cyberdemon fight on the stairs leading to another Quake-like slipgate. The arrangement makes it pretty ho-hum, with plenty of cover to be had, but there's an early chance of you getting splattered if you're not fast. Pretty easy marble / Hell map with some techbase bits. The opening is a little whiteknuckle with the spectres in flashing darkness, but supposing you can find the semi-secret berserk pack, you should be golden. The finale in the outdoor area is kind of a letdown. It's two barons, a clutch of demons, and two shooting galleries of shotgun guys, with plenty of room to maneuver in. Sure, most of it's a damage floor, but that hardly matters when you're toting the map's few nice secrets - a kitted-out plasma rifle and a puzzle-barred soul sphere. I spotted a thread on Doomworld's WADs forum to that effect. Would be awesome if he eventually hammered it out. About that incomplete E1M5: the level that was supposed to fit that slot eventually ended up in Classic Episode as E2M6 and was finished by Anthony Soto. I did the area up until the blue key door, and a little bit behind it. The rest is Anthony's. Thanks for the comment! Definitely looking forward to playing Classic Episode, and the rest of the works you had a hand in. Too bad E1M5 never made it in (though you can find it in class_ep and it's worth seeking out). Otherwise a definite old classic that starts as a solid E1 style replacement (through E1M4) then moves a bit to a style of its own after the filler map. It holds up well after all these years. 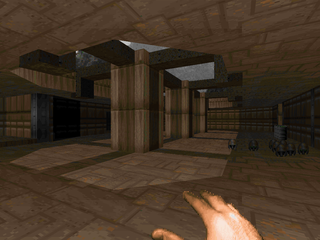 The start of E1M6 always reminded me of The Citadel (Doom II, Map19). Jan's later work in the Classic Episodes 1/2 and The Darkening is no less impressive.